Pre patch that mattered, and he would score a lot of yellow timed finesse shots now it really isn't that important . I’ve got to say, I’m really not feeling ibra either. I’ve subbed him in for the last 25 minutes against tired opponents occasionally (where he should shine) but he just seems to be lacking that special something. I also chucked him into a fitness squad (which is average at best) and even then he didn’t really stand out apart from pulling off a rainbow flick volley. Will likely go into r96 sbc for me. Best value striker in the Game. Just love the card perfect for my play style. 140 games 111 goals & a bucket load of assists. I never do SBC cards but it let me finally find a use for all those untradable red cards I was never going to use. Cost me 80kish before packs. You couldnt have picked a better one to do. Well done! It's possible I prefer him to r94, he's that good. So damn good in the air. I don't understand how people can't get on with him. He just scores goals for fun. Was using right up until I got Red CR7 last week great player usually sub him on now 120 games 110 goals and about 80 assists. 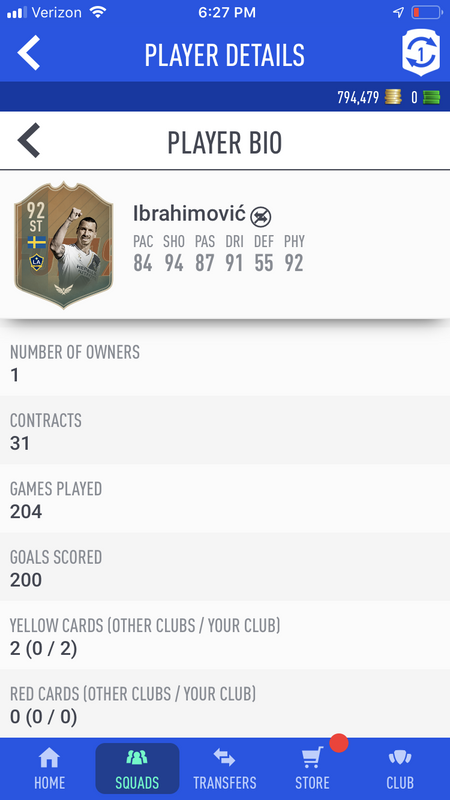 I have played nearly 150 games with Ibra and I honestly think he's only lost about 5 headers in that time. Maybe less. And even then I think it was user error. Doesn't matter if it's Varane, Ramos, VVD. None of them can win a header against him. It's great for goal kicks! Best SBC of all time. He’s been causing me grief ever since he was released. I am still trying to love him but cant beat a defender with him. Is great holding up and knocking it on though. Whether you like him or not, the patch has made him a completely different animal. For the value, he could genuinely be the best SBC of all time as people are suggesting. I wish I had him. Reached my 200th goal with him this evening. What a monster he’s been.